Whether you’re drawn to the one-kilometre private coastline with amazing sea views, the plethora of golf courses surrounding the estate or the luxury of space of the ever-attentive yet unobtrusive service, Montigo Resorts, Nongsa is the resort paradise you’ve been looking for. 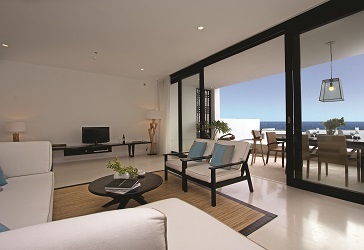 Enjoy your very own pied-a-mer with amazing seaviews from the living room or your private plunge pool. 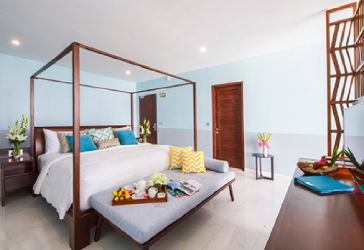 Ideal for couples, Montigo Resorts, Nongsa Studios presents stylish living for those who value comfort and privacy. 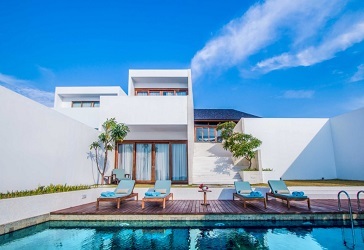 The 88 seafront villas at Montigo Resorts, Nongsa offer everything that you expect from the perfect vacation home: spacious living and alfresco dining areas for family and friends to gather, a private plunge pool to relax and two deluxe bedrooms. The spacious units at the Residences provide the perfect space to relax and unwind. Each unit comes with its own private infinity pool and cabana, specially designed to blend in harmoniously with the natural landscape and magnificent sea views.